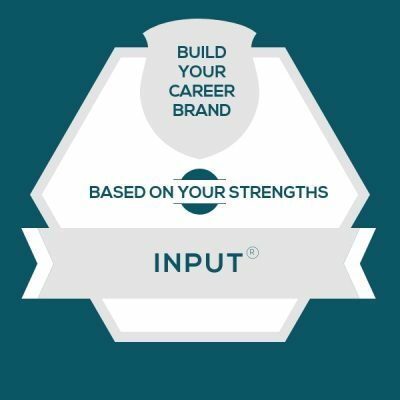 I get a whole lot of questions about how to amplify your CliftonStrengths talent theme of Input with your career. – If you’re exploring this concept as a manager, use this series for career development ideas and even new clues about responsibilities you could give a person with this talent theme so that they can show up at their best. – If you’re exploring this concept for yourself, use this as a chance to build a reputation for your strengths so that you’re more likely to be given assignments that live in your strengths zone. You probably already have a reputation for what you know. Think about your personal resume, CV, or your LinkedIn profile, I bet it’s full of “the what,” which are things like job titles, skills, knowledge, expertise, or the degree you earned. What’s missing is usually “the how,” and this is where your StrengthsFinder talent themes live. Chances are good that you are a lot like my StrengthsFinder training clients, where you don’t physically see your teammates and customers every day. That’s why LinkedIn has become so important for career branding. It’s how your teammates, customers, and vendors go look you up before a meeting – to see who they’re about to talk to. And rather than only telling them what you know, you should also give them a peek at how it is to work with you. These are the cultures, interactions, or situations that feel like soul-sucking drudgery to someone with the talent theme of Input. They might even make you want to quit the team. So I’ll give you a couple of these to be on watch for — because if they fester, you might get the urge to quit the job or become detached and disengaged at work. Busy work. Because people with Input like to learn and then aim that learning at something useful, it’s really draining to do tasks that seems like “make work.” If you lead through Input and you see this happening, challenge yourself to share insights or document the process to make it useful to someone else. This way, you can still feel like you’re curating something useful to teammates. Outdated or unsearchable tools. If you lead through Input and you see something like a database or CRM system or customer service tool that is not kept current, it will be draining. You’ll be able to see the huge value in sharing information, and it will be extremely frustrating to find that others don’t value the repository in the same way. These are ways to apply the talent theme of Input at work, even when the job duties on the team feel pretty locked in. If you’re exploring this concept as a team manager, be sure to have a conversation around these ideas. You’ll both be able to come up with places to apply them. Make information findable. If you lead someone with Input and you want a system for curating, storing, and finding information that everyone can use, send it over to someone with Input. Whether you ask them to make a Wiki or update an intranet page or collect FAQs, the idea of gathering and sharing useful information will light up someone with Input. Research deeply. When you need someone to do a deep research quest, ask someone with Input. They’ll enjoy looking through archives, learning, and then distilling the important parts down to make them usable to others. The idea of researching and applying is highly energizing for those who lead through Input. And then translating them into usable bits will be a fun way for them to apply the information while being challenged to distill the important takeaways. Soak up practices from other teams. Basically, ask them to be a sponge and soak up the approaches that others are using. Then they can apply it to your team’s specific situation and make recommendations. The idea of investigating the options by being curious inquirer will be fun. From there, applying it to your team adds to the energy because someone with Input wants to apply the learning to a specific project or situation.